I started blogging since late May’09. I started this blog for two reasons, firstly, to share my interest in cooking with the world and secondly to make myself very busy so that I do not face boredom :-). I am a born and brought up North Indian Maharashtrian, married to a Kannadiga so my blog has a collection of North Indian, Maharashtrian and Kannada cuisine, as well as my experimental cooking. So one can read about cakes, chocolates and snacks to Bharleli Vaangi, Bissi Bele Bhaath etc. in my blog. People find it easier to understand a recipe if there’s a pictorial and theoretical explanation simultaneously. As far as possible I try to post step by step method of preparation in my posts which has now become my blog’s forte. Make balls of the dough. 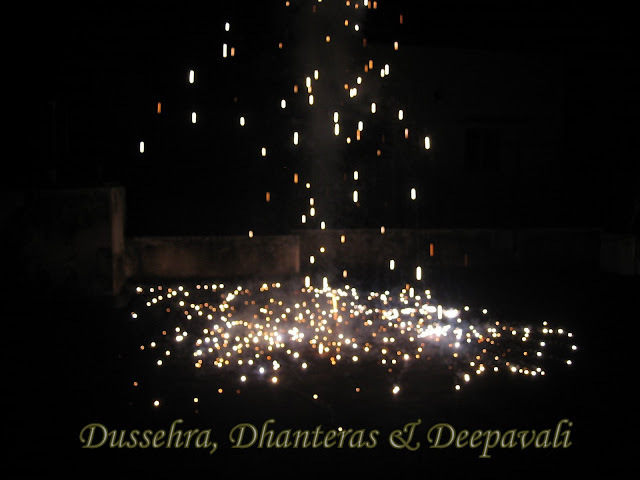 Roll out a ball into thick roti, spread little ghee and then spread thymol seeds. Fold like paper fan, twist and roll into a round. Press and roll slightly like laccha paratha. Cook on hot tava with little oil/ghee till brown spots appear on both sides and it is well cooked. Roast the cashews in little ghee and add it to the powder. Add dry grapes and cardamom powder. Heat about 2 tbsp ghee and fry the dry coconut powder till it changes colour to golden brown. Add this also to the rava mixture. Melt ghee (you will require between 1/4 cup to 1/2 cup, depending on how you prefer it) and mix well. If you dont like much of ghee, you can sprinkle little milk to help in making ladoos. Make small round balls. Quick coconut rava ladoo ready. Priya started off with a bang with 15 recipes on her first day of blogging. She posted 111 recipes during the first month and continues to post an average of 2 recipes every month..Her energy levels and interest in cooking and blogging are astounding. She excels in Vegetarian, Non vegetarian, baking and International cuisine too..
Am a part time working woman and i spend my rest of the day with my family..my part time job helps a lot to manage my day, family and my passions..Earlier i was posting my recipes in an another blog, but few of my friends pulled me to start a blog and i started this blog to put all my posts together, its was just a pass time before but now am an addict to this blogworld.. I dont cook specially for the blog, but i plan to participate most of the events going through the blog with the ingredients presents in my pantry..sometimes i wont even plan, fortunately some dishes i have prepared fits fabulously to the event..I spend my free time in blogging and visiting many other blogger friend's blog to enjoy the virtual treats and leaving comments ,my one more pass time..
EC: Who encouraged you and what was your idea behind this food blog ?? Priya: Some of my friends encouraged me to start a food blog and Ramya of Ramya's Kitchen Corner was the one who helped me a lot and cleared my doubts..When i talked about starting food blog to my husband, he encouraged me a lot..now he is my first and best critic ..
EC: Although your blog is just a little more than a year old, you have crossed 700 recipes..that is almost 2 recipes each day on an average..How do you manage to have the energy and enthusiasm to cook so much ?? Priya : To say frankly, am posting wat i prepared for our lunch and dinner, i do cook sometimes two or three dishes in a day..sometimes i used to plan before preparing my dishes regarding the events going through the blogsphere, thats the secret of my 700recipes..
Priya: Its happened once, but after leaving few messages and reported to google, they have completely removed that site..Its completely ridiculous and i dunno how people enjoy doing this shameful act..Hope those peoples will respect the hardwork and efforts we put on our space..Watermarking our pictures was the best and better way to stop plagiarism, eventhough some peoples are still stealing our hard works..
EC: How has blogging brought about a change in your life ? Priya: I got really a bunch of friends through blogging, many of them are my regular visitors and leaves their encouraging words which helps really to keep my energy and enthu to post and keep my blog active..I learned so many regional cuisines, eggless versions bakes, vegan bakes and so many things espeically regarding photography..
Priya: I won my first cook book through blogging, which is really a memorable and happy moment i never ever forget in life..
Priya: Though i have a huge list of dishes, my favourite always goes to Paneer Jalfrezi..
Pressure cook the rajma with just enough water till soft. P.S. All sundals can be served as salads too.. Thanks SriLekha for the awards. Heat oil, add mustard seeds. When it splutters, add bengalgram dal, blackgram dal, green chillies and curry leaves. Add cooked peanuts, salt and cook till dry. Add coriander leaves, grated coconut and lemon juice and mix well. Sending over to Srivalli for her Kids Delight event. Pressure cook the peas till soft. Heat oil, add mustard seeds, bengalgram dal and blackgram dal. When it splutters, add curry leaves and then cooked peas. Add salt, vangi bhath powder and grated coconut. Mix well and serve. My Love & Passion for Cooking grew after meeting this handsome Hunk Hari who would never tire of praising & appreciating everything I cook. No matter how disasterous it could be. By Product of this Passion is Sandhya's Kitchen. Sandhya's Kitchen is a very passionate culinary corner where I ponder & experiment Cooking. .Looking forward to make it a onestop location for any kind of Vegetarian Breaks in years to come. Cook the greengram dal with little water till soft. Cook snakegourd seperately till soft. Heat oil, add mustard seeds, bengalgram dal and blackgram dal. When it splutters, add asafoetida and then cooked snakegourd and greengram dal. Add salt and mix well. Congrats Prasu, Shanthi and Sailaja for winning the WYF:Breakfast event. Grind the blackgram dal without water to a smooth paste. Add flour, salt, asafoetida, crushed kasoori methi and make a soft dough. Add flour little by little so that the dough doesnt get hard. In case it continues to remain sticky, add some more flour to get the required consistency. Add 2 tsp oil and mix well. Keep covered for 15 mins and then make small balls. Roll into pooris and deep fry in hot oil. Rajeswari or Raks as she is fondly known as among bloggers has completed 2 successful years of blogging. Photos of recipes on her blog tempt you to just grab them from the screen. Beautiful step by step photo presentation with ingredients neatly segregated into tables are the key attractions on her blog. 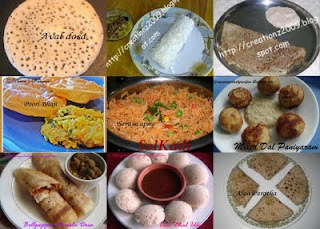 With more than 100 recipes spread over various cuisines, the blog is a treat for all foodies. Thanks a lot Raks for letting us know more about you and your blog. Raks : I am in this blogging world since September 2007. So now its exactly 2 years. So far I have thoroughly enjoyed and learnt, still learning a lot, cooking wise and technically too. I have got a bunch of friends through blogging. I spend quality time in blogging, to browse through other's recipes and comment. I am a house wife, my 5 yr old kid keeps me busy. Other than cooking, blogging, I have interest in drawing, painting but now i rarely do. Also developing interests in photography, I am an amateur though! I started blogging to keep records of my cooking, so that every time I need not call my mother or my MIL for recipes and also to share our way of cooking. From home to home, region to region, state to state our cooking style differs. So this is a wonderful platform to share our style of cooking! I post recipes once a week mostly and what I cook for my family, I take step wise pictures as much as possible and post it in my blog. Step wise pictures I believe that it will help the beginners in cooking, a lot..easy to understand and they may want to know the stages how it will look/come out like. Raks : I started cooking only 3 years back after I was left alone in the kitchen, when I came here to Singapore. When I started to cook, I used to refer to cook blogs a lot and the pictures and recipes really helped me a lot. Then after some time even I thought of starting my own blog and told my husband about my idea. He too have encouraged me a lot in blogging, from teaching me the technical sides, till he bought a camera for the purpose of my blogging! So basically the food blogs out there inspired me to start one of my own! Raks: Through blogging, I have learnt a wide range of recipes, regional cuisines and all of the above I improved my food photography skills. Other than that, I have got some really good friends out there, who really encourage me! EC: The pictures on your blog are so beautiful..Give us some tips for good photography. Raks : As I have mentioned already I am an amateur in Photography, I am still in learning process. 1) I never use flash in my camera. Natural light source will definitely give a more natural look to our dishes. 2)To avoid dull pictures, I keep my food in a brightest place in my home, like a window side where I get a plenty of bright natural light. 3)Take picture from an angle so that both our serving dish and food in it, gets a decent view. Take more pictures from different angle and choose the best which you like. 4)If you really want to improve your pictures in your blog, we have the source of internet, so feel free to Google and search for food photography, which I am doing still. EC : How much technical knowledge does one need for successful blogging ? Raks : I personally feel some basic knowledge will do with which we can start one and we can learn a lot as we are blogging, the only thing we need is "Interest" to know/learn more. EC : Your views on plagiarism and how can we fight it ?? Raks : Plagiarism is definitely what we have to fight for, one can get an idea from others rather than copying it. Its other person's hard work and one cannot steal without their permission. There are some sites/people involved seriously in plagiarism, which should not be encouraged. All of us should join hands to fight against plagiarism. Raks : Take part in the food blog events going around the blogging world, leave kind comments in the other blogs you like and keep in touch and make your recipes and pictures presentable to attract others, be unique, be yourself !! Announcing the launch of "Super blogger Sunday"..Watch out for the first edition of this series tomorrow. Mix all the ingredients except bread, butter,oil and cheese. Make medium sized balls of it and flatten them into square shape as much as possible. Cook this on hot tava with few drops of oil till brown spots appear on both sides. Place this on the bread slice. Spread some grated cheese over it and cover with another slice. Grill or cook on tava with little butter for 2-3 mins till cheese melts. Cut diagonally and serve with sauce. Simple Indian food is glad to introduce two new series about food bloggers shortly. The first one would be about successful and popular food bloggers who would be sharing lots of information about themselves and their blogs. The second one would be to introduce new bloggers (those blogging from Jan '09) and promote their blogs through Simple Indian Food. Make a soft dough of flour, salt and water. Keep covered for atleast 1/2 hour. Cook the bengalgram dal with just enough water till soft. Cool and grind it coarsely. Heat 1 tsp oil, add the onions, dal paste, salt, red chilli powder, turmeric powder and garam masala powder and mix well. Cook for 2-3 minutes. Add finely chopped coriander leaves. Cool and make balls of it. Make balls of the dough. Roll out into a thick poori, place the stuffing in the center and cover it with the dough from all sides. Dust with some flour and roll out into thick parathas. Cook on hot tava with oil/ghee as required till brown spots appear and cooked on both sides. Fry the papad and allow excess oil to drain on a tissue paper. Alternatively you can even roast it on the stove directly. Just before serving, spread chopped tomato, onion and coriander leaves. Sprinkle salt and chat masala. Serve immediately, else it will get soggy. Make a batter of oats, blackgram dal flour and salt of pouring consistency. Heat tava, spread the batter into a dosa and spread few drops of oil in the corners. Spread some chopped onions on the dosa and press it well. When the lower side of the dosa is cooked, slowly turn it over and cook on other side as well. 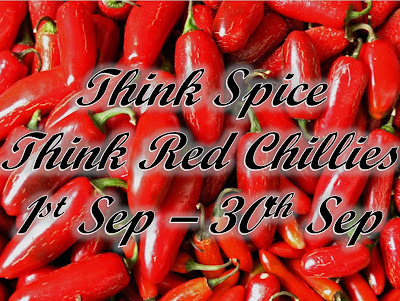 Serve hot with some spicy chutney/sambar. Heat the sugar with some water to get one string consistency syrup. Slowly add in the flour and milk powder and keep stirring well without lumps. Add cardamom powder and mix well. Add ghee little by little and keep stirring continuously till the ghee is absorbed and the mixture gets thick. It should become one big lump, frothing and start leaving the sides of the vessel. Immediately transfer to a greased plate and pat with a greased spoon to get even surface. Cut into desired size pieces and allow it to cool. Healthy and nutritious burfi ready..
Heat a drop of oil and fry chopped onions in it. Cool and grind to smooth paste with soaked cashews. Heat oil, add the onion cashew paste and cook for a minute. Add the curd and dry masala powders - red chilli powder, coriander-cumin powder and then add salt. Mix well and add paneer pieces. Finally add crushed kasoori methi and cream. Mix well for 2-3 minutes. Soak the bread in water for a second and squeeze out all the water from it. Add all other ingredients except oil and bread crumbs. Make equal sized balls and shape them as round or heart as desired. Heat the oil in a tava. Roll the cutlets in bread crumbs if you want it more crisp and then slowly place them in the tava. Cook till golden brown and then slowly turn over and cook similarly on other side. Sending it over to Sia for the MLLA event started by Susan. Cook the tomato pieces in little water for few mins. Cool, grind and strain the puree. Add gram flour, salt, green chillies, coriander leaves, red chilli powder, turmeric powder and garam masala powder. Add a little water as required to get a batter that would be easy to spread on tava. Heat tava and grease slightly with oil. Spread a ladle of batter using a spoon. Spread a few drops of oil in the sides and cook till golden brown in the base. Turn and cook on other side as well for 2 mins. Thanks to Cynthia, Valli and Veronica for helping us out with the marks. There have been some differences in the views of all the judges and based on the total marks of all judges we have arrived at the top 16 entries among the total 124 entries. The reason for 16 entries being selected is that 8 bloggers competed for the 9th and 10th position..So we didnt want to leave out anyone..
We highly appreciate the efforts and enthusiasm among the guest bloggers too and 2 of them have made it to the list - Gauri and Mikki..Since Gauri has also made it to the top 5, we have a special surprise Cookbook prize for her as well. This is apart from the 3 cookbooks that are reserved for the winners after the poll and Gauri will be excluded from the poll. Please note that if we find any discrepancy or cheating done by bloggers to increase the vote count, we will disqualify them immediately from the poll. If you wish to see the total of the marks of each blogger, here is the link..
Heat ghee, add cumin seeds. When it splutters, add cloves, cinnamon, cardamom and fry for a minute. Add turmeric powder and transfer to the vessel with rice. Add salt and cook till soft and grainy. Heat 1 tsp oil, add one onion chopped and tomato. Fry for 2 minutes and add carrot, beans and peas. (can add cauliflower and capsicum too) Fry for a minute and add little water and cook covered till soft. Add a bit of salt, garam masala powder, red chilli powder and mix well. Add the cooked rice and mix slowly without breaking the rice. Heat 2 tsp oil. Make small balls of the grated paneer and fry them till golden brown. Keep aside. 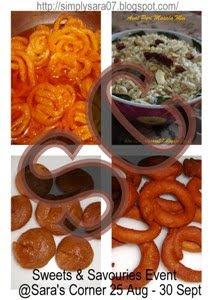 Fry onion pieces cut lengthwise well and then fry potato pieces. Add finely chopped coriander leaves, paneer balls, potato pieces, fried onions, cashews and raisins to the rice and mix well. Make a soft dough of flour, salt and water and keep covered for 1/2 hour. Heat 1 tsp oil, add turmeric powder and mashed rajma. Add salt, red chilli powder and garam masala powder and mix well for 2 minutes. Cool and add coriander leaves. Make small balls of it. Now cover well with the dough from the corners. 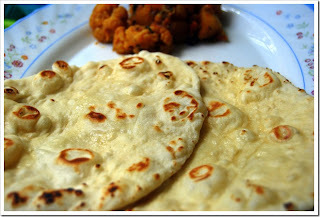 Dust with flour and roll into thick parathas. Cook on hot tava with oil/ghee as required. Sending it over to RV and Sudheshna for the event "Theme of the month-Pregnancy"
Soak the rice for 10 minutes. Heat 2 tsp oil, add bayleaf and onions and fry for 2-3 minutes. Add the masala paste and fry till you get nice aroma. Add the rice (after draining the water in a seperate container) and fry for 2 more minutes. Transfer to the container with the drained water, add salt and pressure cook or cook on a pan till soft and grainy. Mix the ingredients for kofta and make balls. Deep fry or fry in the paniyaram pan using little oil till golden brown. Add koftas to the rice just before serving. Garnish with coriander leaves and cashews. Heat 1/2 tsp oil and add mustard seeds. When it splutters, add the green chillies, ginger paste, curry leaves and turmeric powder. Immediately add the boiled and mashed potatoes, salt and mix well for 2-3 minutes. Switch off the gas and add lemon juice and coriander leaves. Mix well and make small balls. Make a thick batter of gram flour, salt, soda, red chilli powder and asafoetida. Heat the paniyaram pan slightly and pour in 1/2 tsp of oil in each hole. After a minute, dip the potato balls in the batter and then put them in each hole. Cook on medium flame and turn after a minute. Keep turning till golden brown and cooked on all sides. This method ensures that each aloo bonda has a maximum of 1/2 tsp oil. to easycrafts@gmail.com by 30th September '09. I will pick up the picture from your blog...you neednt send it. The roundup would be published during the first week of October. 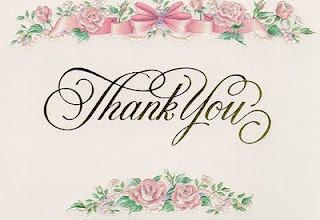 Thanks a lot everyone for participating in the event and pouring in delicious and healthy breakfast ideas..Cynthia, the supercook from Tastes like Home, Srivalli- the Mela queen of Cooking 4 seasons, Veronica- a foodie who feels that the best and honest blogger must win- would help us in giving marks to the recipes..The total marks of each post would be added up and the top 10 recipes would be selected for polling. The top three posts with highest votes would win cookbooks. 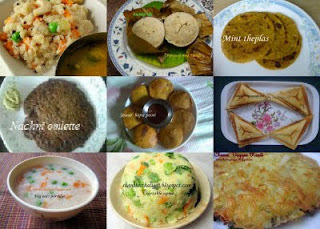 Simple Indian Food completes 2 years of blogging today.. Thanks to all friends, bloggers and visitors of the blog for all the continued support and encouragement..Each and every comment, suggestion and mail of yours is worth millions..
Heat 2 tsp ghee and roast the gram flour till you get a nice aroma. Keep aside. Grind the badam to a smooth paste using a little milk. Heat sugar with 1 cup water and allow it come to a 2 thread consistency. Add the badam paste and mix for 2-3 minutes. Then add the gram flour to it and keep stirring it well. Add cardamom powder and then ghee little by little to the mixture and continue to stir till the mixture starts frothing well. Transfer to a greased plate and allow it to cool for a while. Cut into desired pieces. Update: The roundup for the WYF:Breakfast event is being worked out and should be ready in a day or two..
Heat oil, add the cumin seeds. When it splutters, add onion and ginger and fry for 2 minutes. Cool and grind it to a paste without adding water. Add turmeric powder, red chilli powder, coriander seeds powder, dry mango powder, salt and lemon juice and mix well. Slit the okra in between and stuff this mixture well. Place the okra on a tava and cook well on low flame till done.